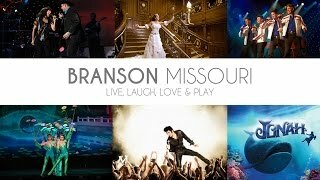 “The Johnson Strings” have made their home in Branson – all 8 of them! Get ready for jaw-dropping music comprised of violins, violas, cellos, bass, piano, mandolin, and banjo in this entertaining Branson Show. With over 100 years of professional training among the siblings alone, and thousands of hours spent perfecting their craft. Have you ever seen four people play one grand piano all at the same time? Forty fingers on eighty-eight piano keys - that’s not many keys per person! The trick fiddling they do on their version of the Orange Blossom Special is something else you must see in this Branson Show! Be sure to stop by the concessions stand and try one of the made-from-scratch, mouth-watering cupcakes or cookies. Karen Johnson, one of the performers in the show, is also a certified chef and is known for her amazing baking! For show times and ticketing information, check out The Majestic!